Cute Kids Rakhis - Beautiful Kids Rakhis Collection with Free Roli-Akshat (chaval), Chocolate and a Beautiful Rakhi Greeting Card. 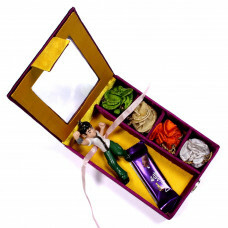 Send Rakhi for Kids with most loved Online Shopping website - RakhisOnline.com. Adorable Kids Rakhi with Ferrero Rocher Chocolates in a Fancy Gift Box for the festive occasion of R..
Adorable Kids Rakhi for the festive occasion of Raksha Bandhan .This Hamper Contains:-A Cute Rakhi: ..